Our cladding is similar to conventional wall cladding except for the millions of small holes in the heat absorbing surface. This cladding is installed a few inches out from the interior wall with air intakes typically located below the mid-point of the wall area in order to maximize overall heat gain while reducing heat losses and overall cavity thickness. The coating on the cladding is a baked-on finish, which is specially formulated for its solar absorption properties and resistance to ultraviolet radiation. Black and dark brown are standard colours and other dark colors are also available. Our standard systems are constructed from 24 or 26 ga galvanized steel or 0.032 thick aluminum. A wide variety of popular profile types are available, yielding greater flexibility in aesthetics and wall design. 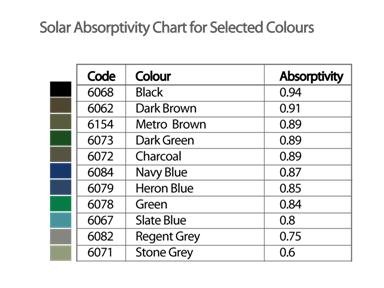 The chart below will guide you in the selection of the best colour for your application. Dark colours, in particular black, yield the best energy output for all applications. For our purposes, absorptivity is a measure of a walls ability to retain solar energy. Colours with high absorptivity and low emmissivity such as those incorporated within MatrixAir™ offer the best overall performance and colour longevity. A wall colours’ absorptivity will contirbute significantly to the energy that may be produced by the MatrixAir™ system. For example, a black wall with a 94% absorptivity would capture about 10% more solar energy than a medium blue coloured wall surface of the same size. Click here to download a PDF version of the Colours available for MatrixAir™.